The one thing I was not expecting from a play about a woman and a child imprisoned in a shed was that it would actually be a musical. For anyone with their head in a bucket, the play Room is the same room as the film Room, which was the same room as the book, Room. Emma Donoghue wrote all of them, and if you haven’t read it, watched the film or seen the play, I’d recommend doing one of the above. Pick your favourite media and you’ll be set for the rest. Room is the story of a young woman who is abducted at 19, and forced to live in a shed in the garden of a man known only as Old Nick. When the story opens she has been there for seven years, and has a five-year-old son called Jack. Together they make do in Room, the only world that Jack has ever known. The story of Room is Emma Donoghue’s baby. And far from me to criticise her for looking after it. First she wrote an award-winning novel. Then she adapted it into an Oscar winning film. Now Donoghue has adapted it one more time and, as compelling as it is, you do start to wonder why. Don’t get me wrong; it’s a good play. The story translates well to the stage, offering some really exciting opportunities for theatrical devices. 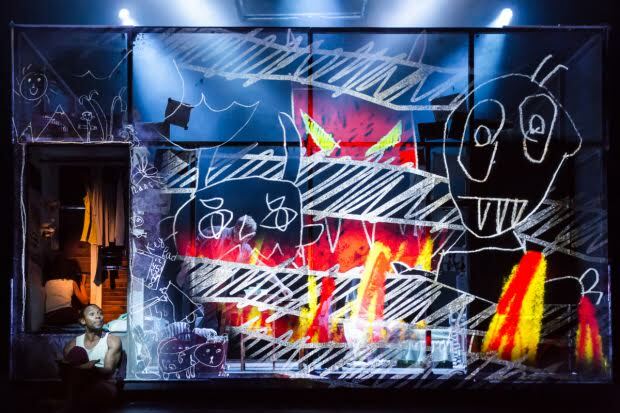 Jack’s scanty belongings are brought to life as puppets, and the cramped and constructed room is filled with bright and bold hand drawn projections of the characters that fill Jack’s imagination. Director Cora Bissett has cleverly manoeuvred the difficulty of a young child taking on such a heavy role – and it is heavy, this play is not for the faint of heart – by gifting us Big Jack. 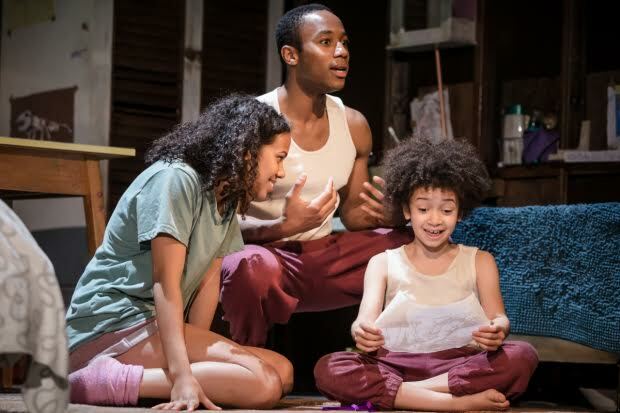 Little Jack, played on press night by Harrison Wilding is the Jack the other characters see and interact with. Big Jack is his interior monologue, played delicately by adult actor Fela Lufadeju. Big Jack is part narrator, and part stream of consciousness for the five-year-old, entrancing the audience with colourful and articulate monologues. He doesn’t distract or detract from Little Jack. Together they help us understand what is happening in the mind of a remarkable child in an unthinkable situation. And yet it still falls a little flat. The musical numbers don’t sit well with the rest of the play, and by the middle of act two I’m starting to fidget. It could be that I’m so familiar with the story, there are no surprises in store, but I think it’s something more than that. 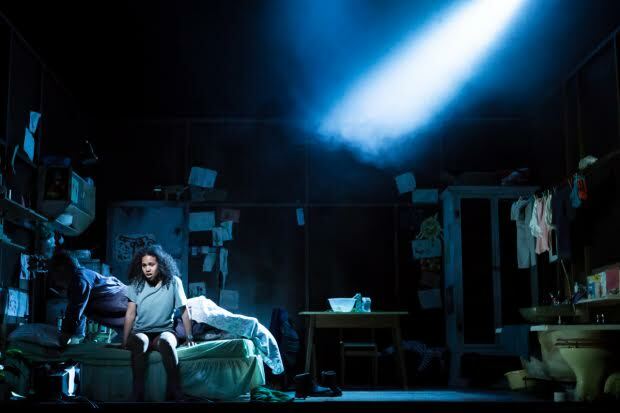 The desolation and desperation of their situation just doesn’t seem as believable on stage – and the believability is what is so impactful about the story. If you haven’t already seen the film or read the book, I’d recommend seeing the play. Otherwise it’s not sufficiently different from its previous incarnations to offer anything new. EJ is a cultural and political correspondent, contributing to Litro, The F Word and Verbal Remedy. EJ studied at the Royal Central School of Speech and Drama, and is a fully qualified puppeteer (yes, really). She is a keen cyclist even though she keeps falling off, and otherwise enjoys growing pansies, playing the ukulele and mainlining custard creams. EJ is also rather good at mime, which we can all agree is an underrated skill.